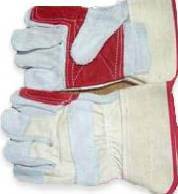 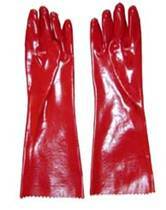 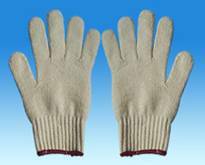 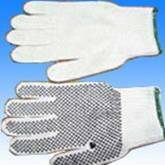 Leather Palm Glove, Size Large, Grain Pigskin or Pigsplit (second pig skin), Lined, Safety Cuff, Pair, full leather index and straight thumb. 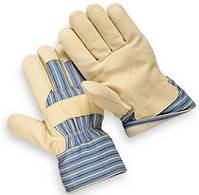 Leather Palm Glove, Grain Pigskin (first pig skin) or Pig split (second pig skin), Lined, Safety Cuff, Pair, part leather index and straight thumb. 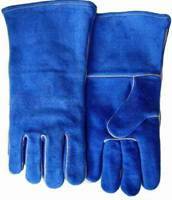 BLUE NITRILE GLOVES, FULLY DIPPED, JERSEY LINING, KNIT WRIST. 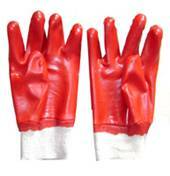 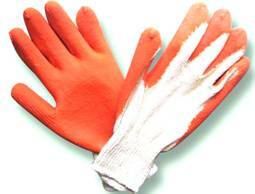 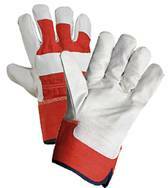 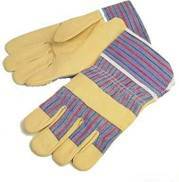 ORANGE LATEX GLOVES, 10GAUGE POLY/COTTON INERLOCK LINING, SMOOTH PALM. 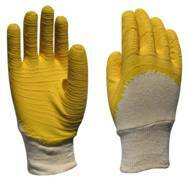 10.5”(27cm),12”(30cm),14”(35cm),16”(40cm),18”(45cm),24”(60cm) Length, jersey liner, fully coated. 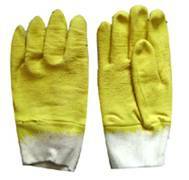 10.5” (26.5cm) length, jersey liner, knit wrist, fully coated.